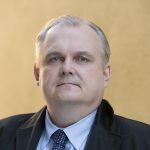 Mr Donald N. Jensen, a Senior Fellow at the Center for European Policy Analysis and editor of the CEPA Stratcom Initiative, held a lecture at the ICDS on 16 May. The lecture carried a title “Putin’s Strategy of Chaos” and sparked a lot of comments and questions from the audience. The event was moderated by Mr Erkki Bahovski, the Editor-in-Chief of Diplomaatia. The lecture was based on Mr Jensen’s recent article (www.the-american-interest.com/2018/03/01/putins-st…).